Here is Calcurt Rich Reward (Rory, front right) with his grandson Calcurt Fawnwood Lion's Share (Toby, front left), the sable boy back right is Calcurt Fawnwood Lion King (Simba, Toby's older brother) and the tri girl back left is Calcurt Fawnwood Black Magic. We feel that this breeding reinforced the Kiltie qualities behind Peter especially the sweet expression and good angulation which we trust you can see in these relatives. Lions Share represents our reaching back to Lucas (Ch.Macdega Canden Coming Home) for that Luke/Reflection blend we value so much. His mother was our beloved Brandy (Calcurt Copper Cameo) combining Rory and his half sister Calcurt Carry on (whose picture appears under the "Tiger" link on my Himalayan section near the end). This cross offered heavy Calcurt linebreeding and produced the natural elegance we enjoy. With these connections we could continue the quality we strive for. The family snapshot was taken in Spring 1999. Go below for earlier pictures of the boys with pedigrees. These photos are not show shots but natural poses in our yard and neighborhood. Although these individuals are no longer with us their quality carries on. Maggie (Calcurt Fawnwood Black Magic) is the mother of our May 1999 litter by Ch.Macdega Asterisk ROM which included our present foundation lady Calcurt Silver Sorceress (Sassy). Check out Calcurt Scarlet Ribbons Lass (Sophie) who carries much of our sable line. While there you can see Ch. Topo Gigio. He is Black Angie's grandfather but notice how much Calcurt Rich Reward resembles Topo. 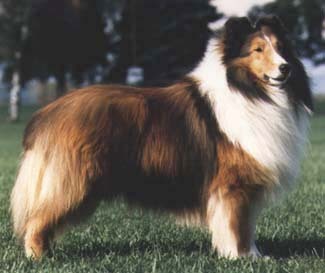 That represents breeding Shelties from the 1960's to the 1990's with a consistent family type. Sophie's page will tell you about Calcurt size development. 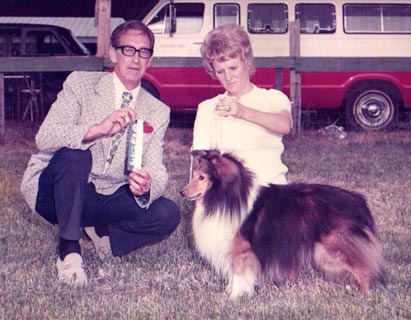 The pictures below will show you how Calcurt Shelties mature. Note Toby at about a year compared to his picture at almost three. And Rory's quality continued to refine from five to nine. His pedigree pictures especially demonstrate the excellent shoulder angulation we strive to produce. Rory contributes to our present line and although Toby did not leave us with direct offspring, his father Siasconset The Social Lion and mother Calcurt Copper Cameo both carry through our female sables. Rory and Toby are sadly missed but happily remembered.